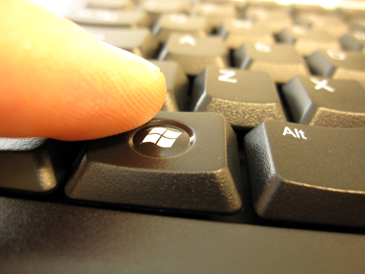 Almost everybody knows at least one Windows Key shortcut: Simply press the Windows Key ( ) and the Start menu opens, ready for you to launch a program with a click of the mouse. Yet, Windows comes with about 30 other Windows Key shortcuts, where you hold down the Windows Key and press a single letter or character to complete a task. Learning a few will really speed up your work, especially on laptops with their awkward trackpads. +E fetches the handy Computer program, which grants quick access to your drives, libraries, and favorite folders. + ← (the left arrow key) pins a window to your Desktop’s left edge; press and the right arrow to place another window against the right edge. That quickly aligns the windows side-by-side on your desktop, making for easy cutting and pasting between them. +1 launches the first program listed on your taskbar; if it’s already running, +1 brings it to the top of my desktop’s pile o’ windows. Similarly, pressing + 2 fetches the taskbar’s second program, +3 calls up the third, and so on. + X brings up the Mobility Center on a laptop, a subset of the Control Panel that deals exclusively with laptop features like checking the battery, and turning wireless Internet access on or off. +Pause Display the System Properties window. +M Minimize all open windows. +Shift+M Restore those minimized windows to the desktop. Ctrl+ +F Search for computers (if you’re on a network). +L Lock your computer or switch users, handy when leaving the keyboard for a break. +T Cycle through programs on the taskbar. Shift+ +number Start a new instance of the program pinned to the taskbar in the position indicated by the number. Ctrl+ +number Switch to the last active window of the program pinned to the taskbar in the position indicated by the number. Alt+ +number Open the Jump List for the program pinned to the taskbar in the position indicated by the number. +Tab Cycle through programs on the taskbar by using Aero Flip 3-D.
Ctrl+ +Tab Use the arrow keys to cycle through programs on the taskbar by using Aero Flip 3-D.
Ctrl+ +B Switch to the program that just displayed a message in the notification area. +Up Arrow Maximize the current window. +Left Arrow Maximize the current window to the left side of the screen. +Right Arrow Maximize the current window to the right side of the screen. +Down Arrow Minimize the current window. +Home Minimize all but the current window. +Shift+Up Arrow Stretch the window to the top and bottom of the screen. +P Choose a presentation display mode if you’re using more than one monitor or a projection screen. +G Cycle through your Desktop gadgets. +U Open Ease of Access Center. +X Open Windows Mobility Center on laptops or netbooks. Posted: March 10th, 2010 under Windows 7, Windows Vista, Windows XP.